غفاری, ولی اله, کریم آقایی, پاکنوش. (1397). بررسی عملکرد و پایداری یک سیستم هدایت مبتنی بر زاویه خط دید در حضور نویز اندازه‌گیری. علوم و فناوری فضایی, 11(1), 31-40. ولی اله غفاری; پاکنوش کریم آقایی. "بررسی عملکرد و پایداری یک سیستم هدایت مبتنی بر زاویه خط دید در حضور نویز اندازه‌گیری". علوم و فناوری فضایی, 11, 1, 1397, 31-40. غفاری, ولی اله, کریم آقایی, پاکنوش. (1397). 'بررسی عملکرد و پایداری یک سیستم هدایت مبتنی بر زاویه خط دید در حضور نویز اندازه‌گیری', علوم و فناوری فضایی, 11(1), pp. 31-40. غفاری, ولی اله, کریم آقایی, پاکنوش. بررسی عملکرد و پایداری یک سیستم هدایت مبتنی بر زاویه خط دید در حضور نویز اندازه‌گیری. علوم و فناوری فضایی, 1397; 11(1): 31-40. در امر هدایت اجسام، عمدتاً از قوانین هدایت مبتنی بر تغییرات زاویة خط دید استفاده می‌شود. 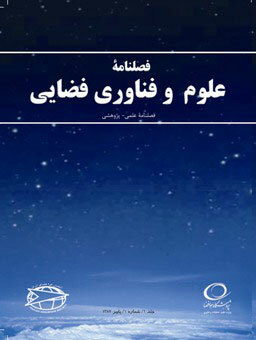 در این قوانین هدایت، معمولاًکمیت‌هایی از قبیل شتاب هدف، تغییرات زاویة خط دید و سرعت نزدیک شوندگی با سنسور مناسب اندازه‌گیری شده و در اختیار قانون هدایت قرار می‌گیرد. مادامی که نویز کمیت‌هایاندازه‌گیری شده، واریانس کوچکی داشته باشد می‌توان اثر آن را در عملکرد سیستم هدایتنادیده گرفت. اما، اگر واریانس نویز قابل توجه باشد، ممکن است بر پایداری و یا عملکرد حلقة هدایت اثرگذار باشد. بنابراین، در این مقاله با در نظر گرفتن نویز اندازه‌گیری، پایداری سیستم هدایت تحلیل می شود. تا قانون هدایت مناسب برای آن انتخاب شود. نتایج بدست آمده، در یک مثال عددی شبیه‌سازی می‌شود. نتایج شبیه‌سازی، کارآمدی روش پیشنهادی در پژوهش حاضر را نشان می دهد. Usually vehicles are equipped with guidance algorithm based on line of sight (LOS) angle. In this way, some measurements like target acceleration, LOS rate, and closing velocity are provided for the guidance algorithm. The noise effect on the guidance loop would be neglected when the variance of the measurement noise is small. However, the stability property and/or performance of the guidance loop may be effected when the measurement noise is considerable. In this paper, a suitable guidance law is proposed in the presence of measurement noise. Then, a numerical example is provided. The effectiveness of the proposed method in the simulation results is shown in comparison with the previous results. G. M. Siouris, Missile guidance and control systems: Springer 2006. P. Zarchan،Tactical and strategic missile guidance، 5 ed. : American Institute of Aeronautics and Astronautics، 2007. C.-D. Yang and H.-Y. Chen، "Nonlinear H∞ Robust Guidance Law for Homing Missiles،" Journal of Guidance Control and Dynamics،vol. 21، pp. 882-890، 1998. R. Yanushevsky and W. Boord، "Lyapunov approach to guidance laws design،" Nonlinear Analysis: Theory، Methods and Applications،vol. 63، pp. 743-749، 2005. V. Behnamgol، A. Vali، and A. Mohammadi، "A New Backstepping Sliding Mode Guidance Law Considering Control Loop Dynamics،" Journal of Space Science and Technology،vol. 8، pp. 9-17، 2016. J. Moon، K. Kim، and Y. Kim، "Design of missile guidancelaw via variable structure control،" Journal of Guidance، Control، and Dynamics،vol. 24، pp. 659-664، 2001. J.-G. Guo، F.-Q. Zhou، and J. Zhou، "Variable Structure Terminal Guidance Law Based on Zero Miss-distance،" Yuhang Xuebao/ Journal of Astronautics،vol. 26، pp. 152-155، 2005. I.-J. Ha and S. Chong، "Design of a CLOS guidance law via feedback linearization،" IEEE Transactions on Aerospace and Electronic Systems،vol. 28، pp. 51-63، 1992. C. D’Souza، "An optimal guidance law for planetary landing،" presented at the Guidance، Navigation and Control Conference، 1997. G. Nazaroff، "An optimal terminal guidance law،" IEEE Transactions on Automatic Control،vol. 21، pp. 407-408، 1976. D. Chwa and J. Y. Choi، "Adaptive nonlinear guidance law considering control loop dynamics،" IEEE Trans. on Aerospace and Electronic Systems،vol. 39، pp.1134-1143، 2003. C.-S. Shieh، "Tunable H∞ robust guidance law for homing missiles،" IEE Proceedings-Control Theory and Applications،vol. 151، pp. 103-107، 2004. C.-L. Lin and Y.-Y. Chen، "Design of fuzzy logic guidance law against high-speed target،" Journal of Guidance، Control، and Dynamics،vol. 23، pp. 17-25، 2000. T. Binazadeh، M. H. Shafiei، and E. Bazregarzadeh، "New Approach in Guidance Law Design Based on Finite-Time Partial Stability Theorem،" Journal of Space Science and Technology،vol. 8، pp. 1-7، 2015. I. Mohammadzaman and H. Momeni، "Short Time Stability Approach to Guidance Law Design،" Journal of Space Science and Technology،vol. 3، pp. 37-44، 2010. D. Zhou، S. Sun، and K. L. Teo، "Guidance laws with finite time convergence،" Journal of guidance، control and dynamics،vol. 32، pp. 1838-1846، 2009. V. Ghaffari، "Stability Analysis and Guidance Law Design with Finite-Time Stability Property in Presence of Measurement Noise،" Journal of Nonlinear Systems in Electrical Engineering،vol. 4، pp. 97-110، 2018. J. Deyst and C. F. Price، "Optimal stochastic guidance laws for tactical missiles" Journal of Spacecraft and Rockets،vol. 10، pp. 301-308، 1973. A. Merz، "Stochastic guidance laws in satellite pursuit-evasion،" Computers and Mathematics with Applications،vol. 13، pp. 151-156، 1987. Y. Watanabe، E. N. Johnson، and A. J. Calise، "Stochastic guidance design for uav vision-based control applications،" in AIAA Guidance، Navigation and Control Conference، 2008. K. Ogata and Y. Yang،Modern control engineering، 5 ed. New Jersey: Upper Saddle River، 2010. R. Khasminskii،Stochastic stability of differential equations، 2 ed. : Springer 2011. S. Rubenthaler، "Numerical simulation of the solution of a stochastic differential equation driven by a Lévy process،" Stochastic processes and their applications،vol. 103، pp.311-349، 2003. H. Deng، M. Krstic، and R. J. Williams، "Stabilization of stochastic nonlinear systems driven by noise of unknown covariance،" IEEE Transactions on automatic control،vol. 46، pp. 1237-1253، 2001. N. F. Palumbo، R. A. Blauwkamp،and J. M. Lloyd، "Basic principles of homing guidance،" Johns Hopkins APL Technical Digest،vol. 29، pp. 25-41، 2010.